NunaTavo or what is known as the One Click Wonder is very similar to the Nuna Mixx2 model but it is much cheaper and more compact than other models. Although it doesn’t come with a reversible seat, you can turn it into a great travel system when you are using the NunaPipa car seat without having to use additional adapters. All you have to do is just click the car seat into the frame and with the update for 2017, it is still the same way. Similar to the Mixx2, the Tavo has a deep one hand recline that will almost go completely flat which is a great position for those newborns. The seat is pretty roomy and works for children up to 50 pounds. I love the canopy as it is a large canopy that has a pop out sun visor and for a bit of extra protection it even has a hidden dream drape that will protect your little one from the sun when the seat is completely reclined. There is also a peekaboo window that uses magnetic closures and it has a zipped mesh panel that provides your little one with great air circulation. The Tavo also comes with and adjustable handle bar, flip flop friendly brake, adjustable leg rest, bumper bar, all wheel suspension, and easy to access basket. I love how easy it is to maneuver. You can easily push this stroller with one hand and when you fold it up, it is very easy to do and quite compact. The stroller will collapse into itself and will lock. All of these features fit into a package that weighs only 24 pounds, which is lighter than the Mixx2 model. This is a daily stroller that you can use for long walks in the park to running your daily errands in town. The wheels are the perfect size and can easily tackle various types of terrain that you have to deal with. This is a great stroller that I can easily say is my go to stroller. 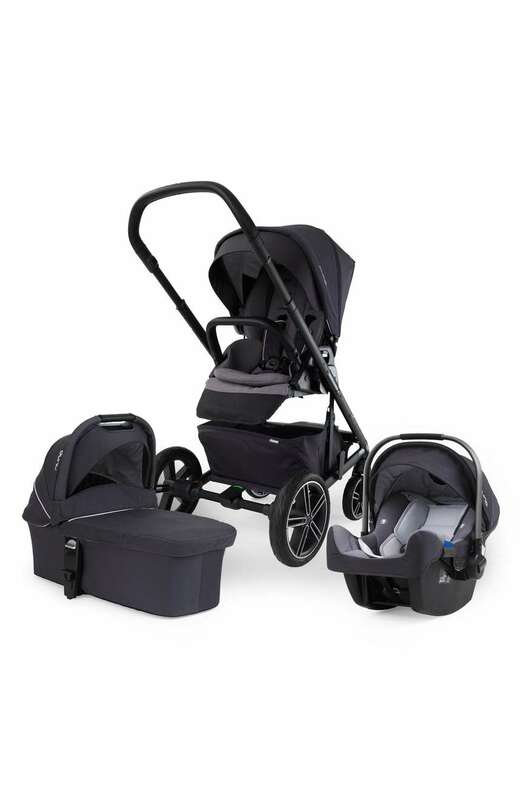 It goes from Newborn to toddler age and it has a roomier seat and the canopy is higher up than on other stroller models. When you look at other reversible seat strollers, you notice that they have smaller seats and low canopies that are not that comfortable for a squirming toddler. The Tavo really has growing room and it is a very affordable price of under $350. That is a great deal. The Nuna quality really states well made and solid products. The fabrics are always durable and soft. You will never get the flimsy and plastic type of feel from any of their products. The only thing that I could think to change about this stroller is how heavy it is. For being a non reversible seat stroller, I believe that 20 pounds would be a much more reasonable weight for this particular stroller. The Nuna Tavo comes in 4 different colors and does include the bumper bar. For an additional $300 you can get the stroller with the NunaPipa car seat. It has a huge canopy. The canopy is quite larger and has the pop out sun visor that is called the dream drape. This visor will give your little one plenty of coverage even when the seat is fully reclined. What I like about it is that it is made from a knit fabric that it provides plenty of air circulation while it blocks the sun. When it isn’t being used, you can just zip it back up. It also comes with a mesh peekaboo window that has magnetic closures. Out of all the strollers that I have tested, this canopy is the best one that I have come across. It also comes with an adjustable handle bar that ranges between 42 inches to 38 inches from the ground. It works well for me and my partner. Then you have the roomy seat. The seat is over a foot wide and has a 19 inch back and there is over 25 inches from the back of the seat to the canopy top. The seat works for newborns to 50 pounds. That means that you can use this stroller through your infant and toddler years without any real issues. You can remove the fabric on the seat and wash it in your washing machine. I love the material quality that was used on the canopy and seat. It is very durable but quite soft at the same time. It can also provide a bassinet type of environment for your little one by lifting the leg rest up and using the hidden material under the leg rest to enclose the sides of the stroller. Just clip the material to the frame of the stroller. Then fully recline the seat and your little one will have a safe and cozy place to take a nap or a rest in. If it is a bit chilly, then you can throw a warm blanket on top which creates a unique cozy and warm napping area. It even has a pretty large basket. The basket is perfect in size for my purse and diaper bag and it is quite easy to access simply by bringing the fame of the basket down. You can access the basket even if the seat is fully reclined and there is even a zipper pocket that is great to store small items such as keys, wallet or phone. I really do not have anything bad to say about this stroller. The only thing I didn’t like was that it is a bit heavy for being this type of stroller. If you look at other model types, they all weigh about 20 pounds. This weight limit is normally found on those models that have reversible seats. Overall, this is a great stroller and it is perfect for a growing little one. Since it can also be used as a travel system, that also makes it a bit better. 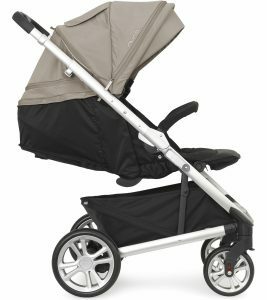 It has color options and a lot of great features that will really bring this stroller to the top of my list. Get ready for the hottest stroller on the market right now. If you have been looking for a stylish reversible seat stroller that has a large basket, compact, isn’t heavy and has all terrain wheels then this is the stroller for you. The Nuna Mixx has all this and then some. It is a full size stroller that comes with all terrain wheels and a reversible seat. 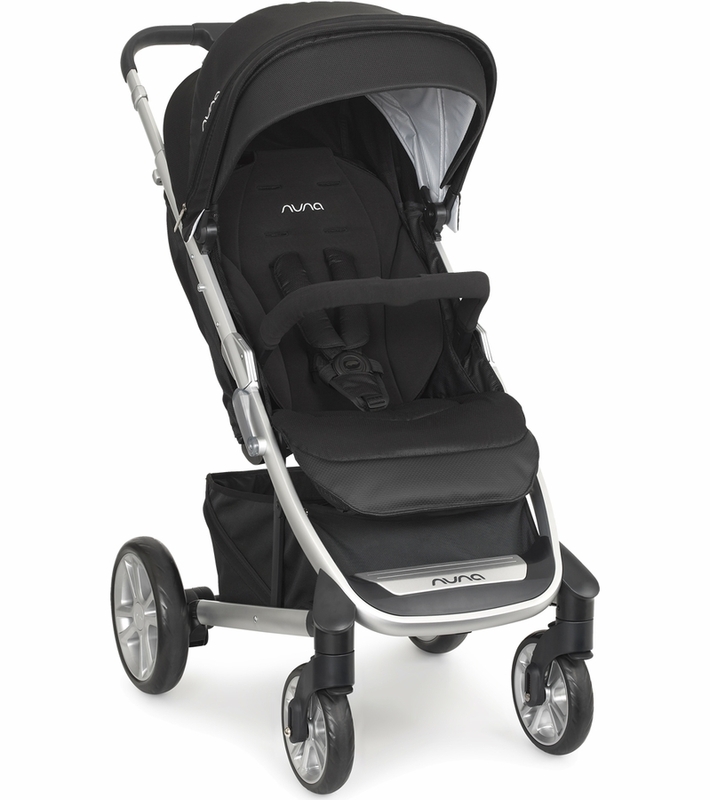 The Nuna Mixx is a car seat stroller that provides swivel wheels for maneuverability. It can be folded and easily placed in the trunk, being a compact stroller is great for a new baby or toddlers. It also has a sun canopy for sunshade. 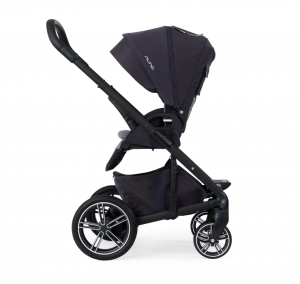 However, if you are needing a jogger stroller, the Nuna Mixx may not be for you. It has a pretty sleek look to the buggy and has a really roomy seat. It also has a deep incline, adjustable handlebar, adjustable leg rest, reversible seat, flip-flop friendly brake, and a no-rethread harness. The basket is also huge. I was able to fit 2 large diaper bags in there as well as my purse. Another one of my favorite features is that since it has a deep incline, I can lift the leg rest up and recline the seat flat so I can let my little one nap in comfort. Another thing about the Mixx is that it doesn’t have that V shape seat that keeps your little one in the sitting position. The seat works from newborn to 50 pounds. There is even a large canopy that has a pop-out sun visor which keeps your little one protected from the glaring sun. It is a premium stroller like the Bugaboo Cameleon 3 and the Stokke Xplory. You can even use this stroller as part of a travel system simply by replacing the seat with the Nuna Piupa car seat. It doesn’t have any other adapter for other car seats, which is kind of sad. 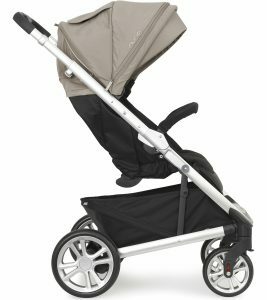 You really can’t fold this stroller with one hand, but it is really easy to fold and is quite compact for the type of stroller it is. Not to mention, you can actually fold this one up with the seat attached. There is also an automatic lock and you can roll it around like luggage. It also only weighs 25 pounds. This is a really great stroller, but it isn’t quite perfect. The price is a bit steep at $500, but that is kind of reasonable for a luxury stroller. It glides easily over any bumps and uneven surfaces. I was able to maneuver it easily with 1 hand while it was loaded down. It has a really large canopy which I love. It is a 3 panel canopy with a pop-out sun visor. You can even zip up the middle panel to make it much smaller. It also has a peek-a-boo window that is made from dark mesh which gives your little one more air circulation on those super humid and hot days while you protect them from the sun. It also has a magnetic closure instead of Velcro, which is much quieter so you don’t have to wake up your little one. I also love the adjustable handlebar. There are three different positions and it goes to about 42 inches from the ground. It is also covered with rubber instead of foam which tears easily, even though it feels super nice at first. Foam just makes you have to walk around with a luxury stroller that is missing some pieces of foam on the handlebar. I think the rubber does it a lot of justice. It is still comfortable to grip. The reversible seat comes with a 1 hand lever recline. It has 5 different reclining positions including completely flat. I love that I can put is completely flat and lift the leg rest up so my little one can take a long nap in a bed like environment. Not to mention using the flat recline for a diaper change, which is great for a quick diaper change. You can flip the seat around easily by pushing the levers on the sides and swinging it around to put it in place. You can also replace the seat with the Pipa car seat which is great for the first 6 months after birth when your little one is mainly in a car seat. The seat fabric is also machine washable. It also comes with a 5 point harness that is padded and eventually can be converted into a 3 point harness. The leg rest has 3 positions it can be in. It also has a huge storage basket. If you are a shopper, then you will love the basket. It can fit just about anything that you put in there. The wheels are never flat rubber wheels that have front swiveling wheels but they can be locked to go straight. This is literally an all terrain stroller, so it can handle just about any surface you take it on. It also has all wheel suspension, which absorbs the bumps to make the ride for your little one so much smoother. Another interesting feature about the Nuna Mixx is that it comes with a rain cover. That was quite awesome and it is something that I do carry around with me. It is great for that unpredicted weather when I am out with my little one. The only things that I do not like about the Nuna Mixx Stroller is that it will only work with the Nuna Pipa car seat. It would be so much better if there was actually an option for it to become a travel system by using other popular infant car seats. It doesn’t come with accessories. There is actually a very limited amount of accessories for this stroller. The bumper bar and rain cover are about it. There are only 3 colors to choose from. I am a very visual person, so there isn’t a lot of colors to choose from. It would be a bit better for me personally if the fabrics were more colorful with interesting designs and even some patterns. It comes in three colors, Mykonos ( a blue-ish color), Caviar ( a black color) and Slate ( a gray-ish type of color). I have no idea who came up with the interesting color names, but in truth it comes in blue, black or gray. The frame only comes in silver. The Nuna Mixx does come with a 2 year warranty from your purchase date and you have to be the original owner. 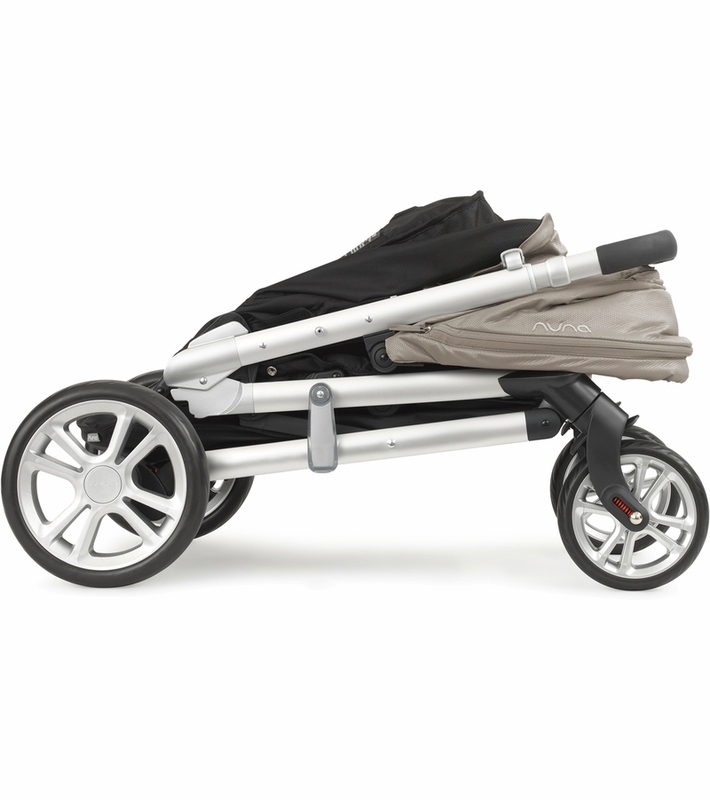 If you’re looking for a competitor to the Nuna Mixx, try the UPPAbaby Vista.